Dude, if you are reading this article it’s likely that you are not part of the aforementioned statistics and if you keep reading you’ll learn about some surfers that are working to inspire a kid to surf, change a life and hopefully give them the stoke they need to live a better reality. I know surfing changed my life and it probably changed yours. Carissa Moore (Hawaii), Granito de Arena’s newest member. The moment these kids stand on a surfboard and ride a wave for the very first time they fall in love with the ocean’s all-embracing harmony—followed by a huge smile on their face and lots of stoke. Let’s not forget these children’s reality, most of them need a reason to smile and I can’t think of a better way to create one. Granito de Arena organizes surf camps + trash clean-ups for the local communities. This eye-opening statement is then followed by creative workshops for the kids and their caregivers. They show them fun ways of making something useful and functional reusing plastic bottles—pieces of furniture, walls for houses, mosquito traps (very essential for most tropical areas), among other brilliant ideas. Andrés Fernández, Granito de Arena’s founder, speaking to Salvadoran kids. Andrés understands the importance of addressing these issues and he feels that through surfing networks, problems can more easily be addressed. The pro surfers presence is very important because it influences more people and more sponsors to participate locally and internationally. 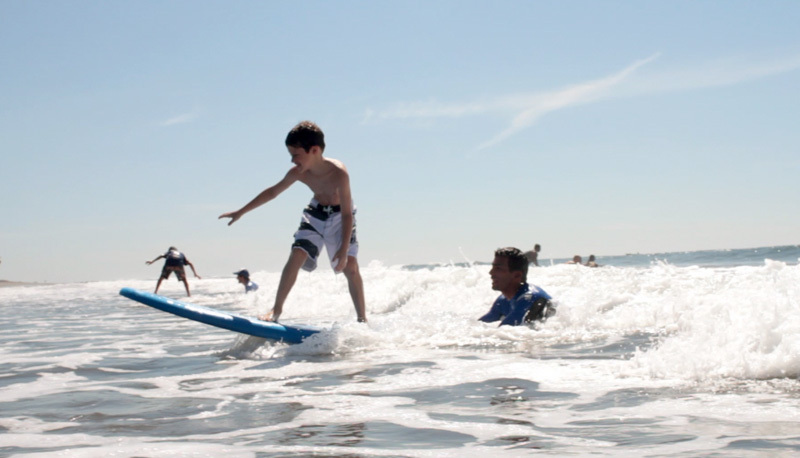 Who wouldn’t want to spend a day with a pro surfer learning to surf?